A simple and warming vegan stuffing that will make your family and friends re-think saving room for dessert. Lightly sweet, easy to prepare cornbread, cozy thyme and sage, and hearty mushrooms and vegetables, all baked in a flavorful vegetable stock. Cube the cornbread into 1” pieces and spread it on a parchment-lined baking sheet in a single layer. Bake for 20-25 minutes, turning once halfway through, until golden brown and toasted. 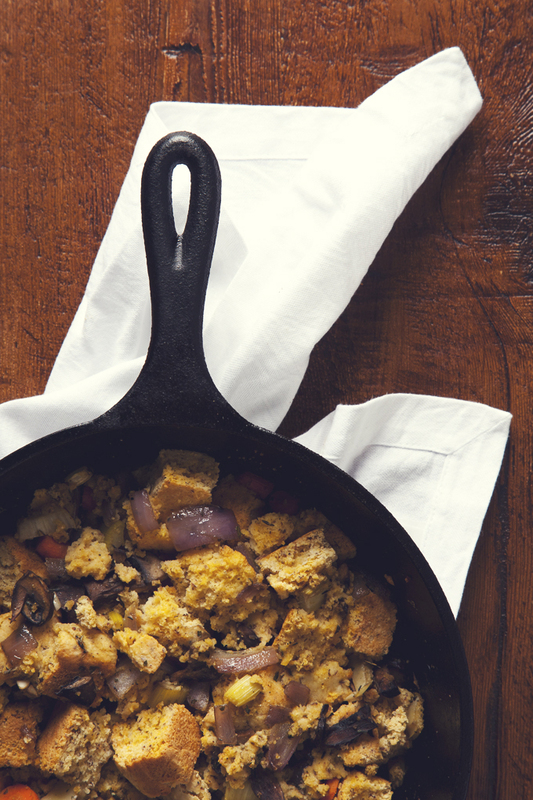 While the cornbread is toasting, add the olive oil to a deep 10” cast iron skillet over medium heat. When the skillet is hot, add the onion, garlic, carrots, and celery. Cook for 8-10 minutes, stirring often, until the vegetables have softened. Stir in the mushrooms, sage, thyme, and parsley. Cook for 1-2 more minutes, then season with salt and pepper to taste. Remove the skillet from the heat. Add the cornbread croutons to the skillet and gently toss them with the cooked vegetables. Pour in the vegetable stock and gently toss once more. Cover the skillet with foil and bake for 20 minutes at 350 degrees F, then uncover and continue cooking for 5-10 more minutes, until the top is golden brown. Serve immediately, topped with a pour of easy vegan gravy if you like!